Blello was founded in 2017, making it a fairly new voice in the bed-in-a-box sphere. The retailer’s mission? To harness the powers of the “hues of snooze” to create a mattress that’s as stress-relieving as the color blue and as buoyant as the color yellow… see what they did there? Clever wordplay aside, today I’m going to be putting the Blello mattress to the test to see just how comfortable it actually is and to figure out if this colorful bed might just be the perfect match for you! Continue reading below for my full review of the Blello mattress. Don’t have time to read it all? Click here to skip to the bottom and check out my review summary. The Blello is built with three layers of foam, measuring up to a total 10” of comfort. The mattress is designed to offer sleepers a balanced, medium firm feel, combining responsive foams together to combat that stuck-in-the-bed feeling. But I can’t be sure how well the Blello pulls this off until I inspect it’s different layers, so let’s dive on in! Cover – The cover is crafted out of a three-layer ticking fabric, which makes for a tightly woven and durable material. It’s also quite stretchy and breathable. 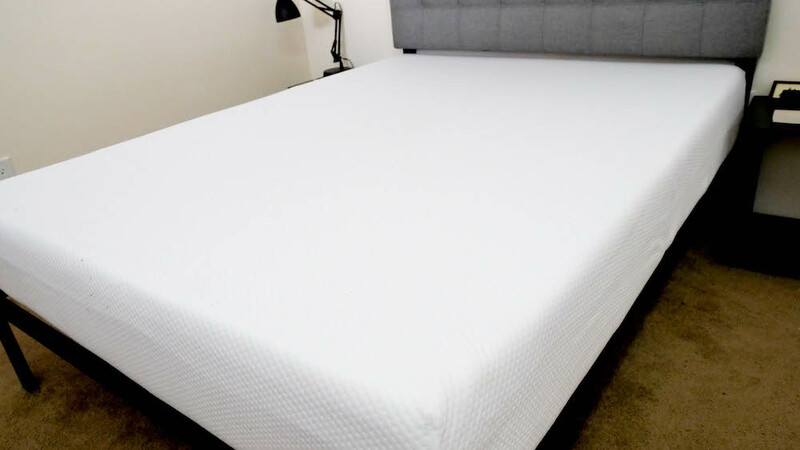 Comfort Layer – The comfort layer is made up of 1.5” of the brand’s proprietary Serene Foam, which is a responsive alternative to traditional memory foam. This material is soft to the touch and will provide you with some immediate relief, but also responds quickly to pressure, which means you won’t sink too far into the bed. I should add that while traditional memory foam has a reputation for overheating, the material used here sleeps cool. Transition Layer – Below the comfort layer, you’ll find 2.5” of Qualatex Foam, a latex-like material that’s got some great bounce to it. The main function of this section is to gradually transition the sleeper from the soft top layer into the firmer base below, while also working to support the user with a pleasant lift. Like latex, this foam is also fantastic at dissipating body heat. 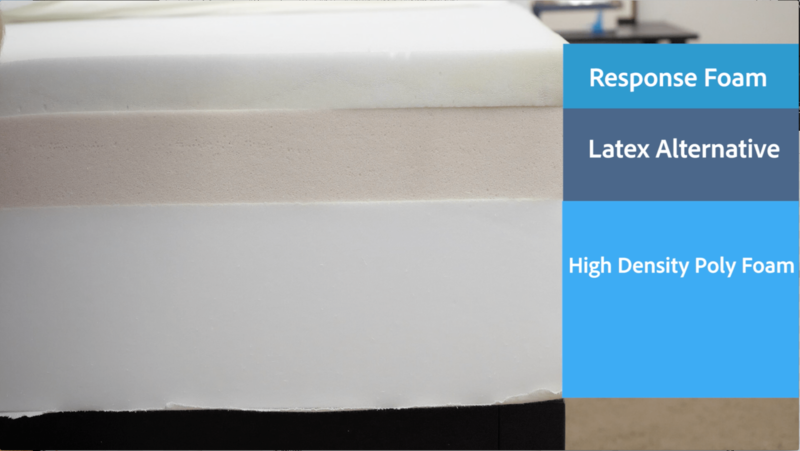 Foundation Layer – The base of the mattress is comprised of 6” of high-density polyfoam. This layer acts as the main support for the softer foam layers up top, providing the sleeper with some nice deep compression support. After taking a look at the construction of the Blello, let’s chat about the firmness and feel. I started off by applying light hand pressure to the mattress and found that I was immediately interacting with the soft comfort layer. I was able to press into this section very easily, experiencing some pleasant contouring as my hand sank into the responsive foam. Pushing in further, I encountered the latex-like transition layer, which lifted me up and out of the bed. 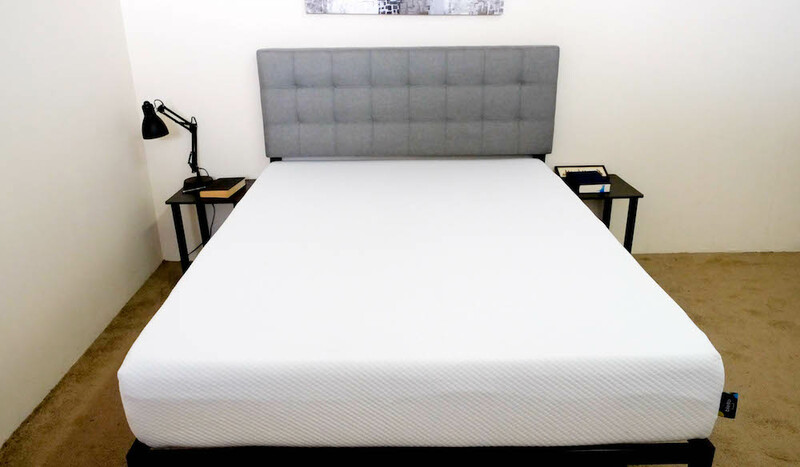 Since different-sized folks are going to feel the firmness of a mattress, well, differently, I decided to ask three other testers to join me for this next test. All four of us took a quick rest on the Blello and gave it an individual firmness rating. I then compiled those scores on the graph below, which will hopefully give you a better sense of the firmness range you can expect from the bed. 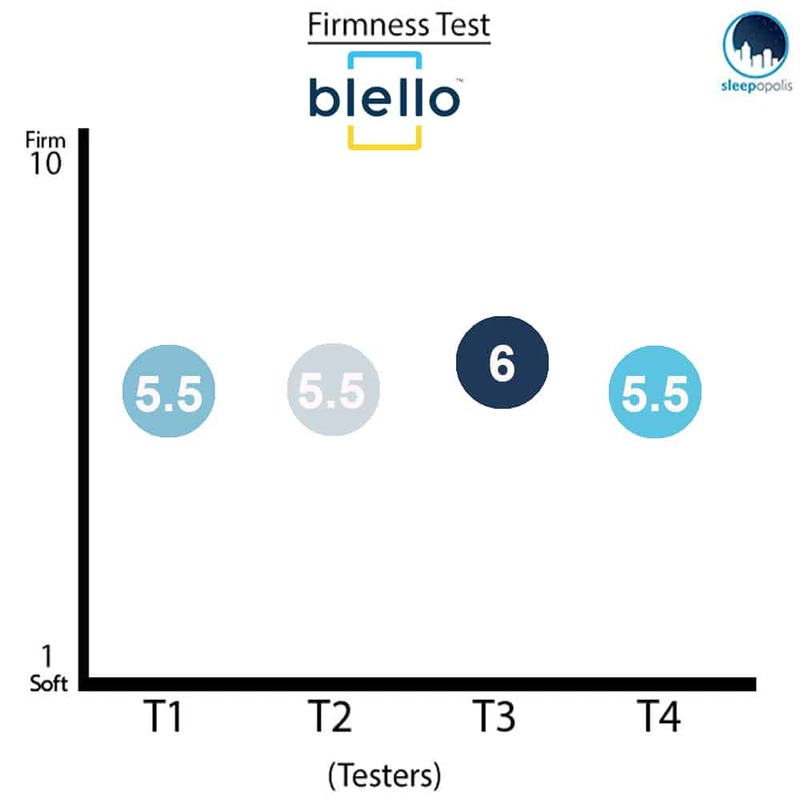 As you can see in the graph, we were mostly in agreement about the firmness of the Blello, giving it an average rating of 5.6. When compared to the industry standard of 6.5 for medium firmness, it’s clear that this bed is just a touch softer than medium firm. I personally gave the mattress a 5.5, finding that the top two foam layers provided a satisfying combination of sinkage and body contouring. That being said, these sections are also quite responsive to pressure, so I never felt like I was stuck in the bed. 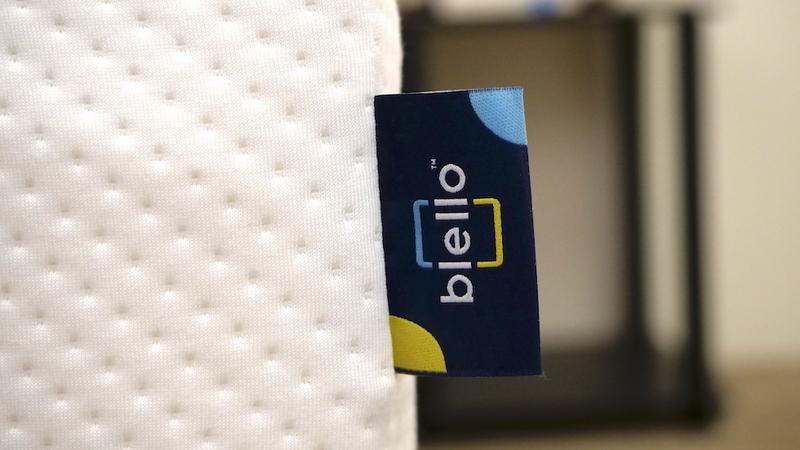 In line with other all-foam mattresses I’ve reviewed, I’d say the Blello would be a good fit for side sleepers, a recommendation I’ll tease out in the next section. Instead of just trying to describe how the Blello feels, I want to give you a visual representation of where you’re likely to feel pressure points form while lying on top of it. Back – Lying on my back, I experienced nice relief from this mattress. My weight was evenly distributed across the surface and I felt myself sinking slightly into the top foam layer, which provided excellent comfort to my lumbar region. Even for this contouring, I never felt like I was stuck in the mattress and was able to change positions easily. Side – Rolling onto my side, I continued to feel quality comfort. In my opinion, the Blello is on the softer side of medium firm, which is great for side sleepers as it will allow them to sink in for pressure relief at the shoulders and hips. As you can see in the graphic above, hardly any pressure points formed in this position. 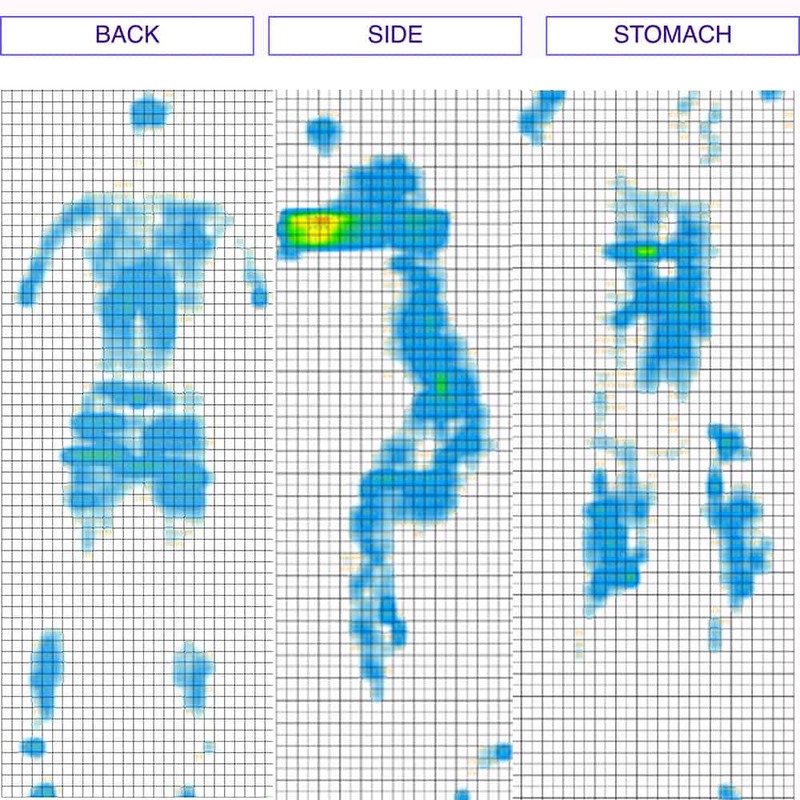 Stomach – Once I got onto my stomach, I began to notice pressure forming at my chest and lower back. Since I found the Blello to be a medium soft mattress, I’m not too surprised by these results, as most stomach sleepers tend to prefer firmer mattresses that keep their spines in an even alignment. Next up, let’s gab a bit about motion transfer, which will be important for those of you who plan on sharing your bed with a partner. 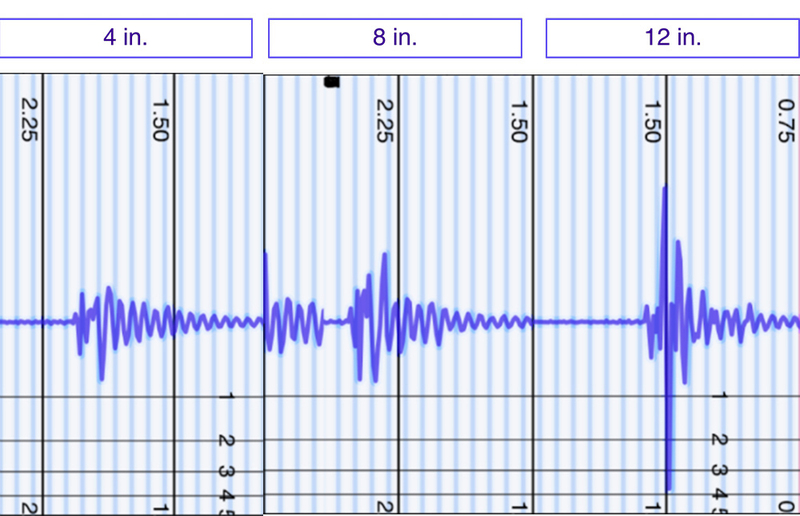 Basically, this test is going to let you know how much disturbance you’re likely to detect from one side of the bed to the other as your bed mate tosses and turns in the night. I’d say these are average motion transfer results, but that they’re similar to ones I’ve seen from other all-foam mattresses on the market. 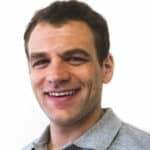 While you’re likely to feel some disturbance as your partner rolls around, it’s not likely to be too extreme as to wake you up in the middle of the night. When making a big mattress purchase, you’ll want to know whether you’re going to sink “into” the mattress or lie “on top” of it. To help you visualize this sinkage, I placed four balls of varying sizes and densities (a 6 lb medicine ball, a 10 lb steel ball, a 50 lb medicine ball, and a 100 lb medicine ball) on the mattress and measured how much they compressed the surface. These are pretty average sinkage results, consistent with other all-foam mattresses I’ve tested. What this tells me is that you’re going to sink through the top two layers of foam, but that these sections’ quick responses to pressure are going to push back against you so you never feel too stuck in the mattress. And finally, let’s take a look at edge support. If you’re going to share your bed with a partner and need to use the entire surface area of the mattress, this test is going to be particularly crucial for you. Lying on my back near the edge of the bed, I felt about as supported as I did in the center. Scooting even closer to the side, I did detect some compression through the top comfort layer, which you’ll notice in the photo above. This is to be expected from a softer foam mattress like the Blello, so isn’t too out of the ordinary. Switching over to my side, I experienced even deeper compression through the top comfort layer. In the photo, you can really see how this section contoured to the curves of my body. That being said, the transition and foundation layers didn’t collapse under this pressure, so I still felt fairly solid at the edge. In this position, I wanted to simulate what it would feel like to be sitting on the bed in the morning when you’re lacing up your shoes and getting ready for the day. A lot of foam mattresses experience severe compression in this position, and the Blello was no exception. If you’re convinced the Blello is the right mattress for you, the size and pricing information for the mattress are below. Please note that these prices reflect standard pricing, but coupons are often available. IS THE BLELLO MATTRESS RIGHT FOR YOU? Now that we’ve taken a closer look at the Blello mattress, it’s time to discuss who it’d be a good fit for. 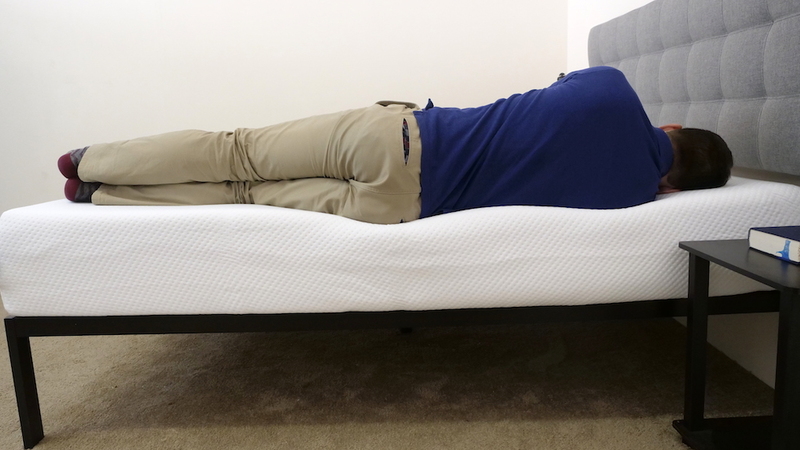 Pressure relief without feeling stuck – The Blello would make a good bed for anyone who wants pressure relief without that stuck-in-the-bed feeling. 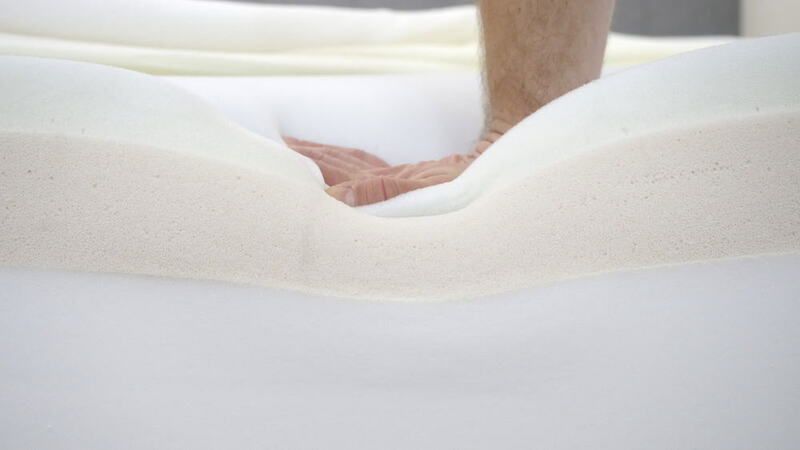 While the soft foam top layers provide excellent comfort, they also respond quickly to pressure, lifting the sleeper out of the bed. Side sleepers – Since side sleepers tend to prefer softer beds, the Blello could really fit the bill for those who doze primarily on their sides. Contour – If you like deep body contouring, you’ll find a lot to love in the Blello. The comfort layer is built from a material that’s similar to memory foam in that it’ll allow for plenty of sinkage and cushiony support. Click here to learn more over at Blello!